The Trustees' Report highlights the continued fiscal challenges that face the Social Security program (SSA). In 2011, the Board projected that Social Security would be unable to provide full benefits only through 2036; they have now adjusted that projection to 2034. Social Security is now paying out more in benefits than it receives in total revenue, years earlier than previously projected. Social Security, of course, does not go insolvent. Suggesting Social Security is or may become insolvent or bankrupt raises hackles needlessly even as it delights ideologues. While looming benefit cuts are a serious concern that can and should be avoided, the SSA is not a business. It is a facet of the American government that has committed to guarantee retirement funds to the American worker. Experts warn that the longer Congress waits to solve Social Security’s pending shortfall, the more expensive it will be to fix. In 2011, the Social Security Board of Trustees estimated it would take $6.5 trillion to avoid benefit cuts over the next 75 years. This year, they calculate that it would take $13.2 trillion. Fixing the program that economists call the most “valuable component of our retirement system,” will be relatively straightforward. House Republicans propose cutting benefits and raising the retirement age to buoy the SSA. Thankfully, this solution appears dead on arrival, given the public’s overwhelming support for maintaining or increasing current levels of Social Security benefits. The bill would keep the Social Security Trust Fund “solvent,” ie paying out full benefits, for the next 75 years according to the SSA Board of Trustees. It would accomplish this by applying the payroll tax to income over $400,000 and gradually increasing the payroll tax rate on both employees and employers, among other measures. Congress could also consider applying unearned income such as capital gains to Social Security tax. If we were to FICA a tiny portion (1-3 percent) of capital gains, we would solve the Social Security problem easily -- in fact, it would present a significant opportunity to increase benefit levels substantially, possibly by two times. With straightforward solutions available, Congress has no excuse not to address Social Security’s long-term shortfalls. Exacerbated by a brand new $1.5 trillion hole in the budget, this is a year when people will hear threats to Social Security. They may believe it. Democrats, as they have in the past, will provide reassurance. This cycle especially, this reassurance is likely to provide a large benefit for them in the midterms. 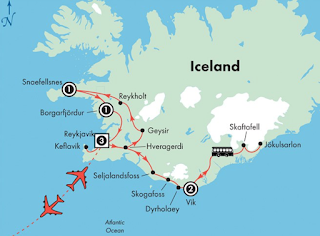 Another possibility – Iceland feels protected by its Scandinavian friends (although Iceland declared its independence from Denmark in 1944), perhaps the way Australia and Canada feel protected by Britain. What are the lessons of Iceland? 1. Better for the economy for the government to protect small depositors than the outsized financial sector. 2. Easier to do this when the country is so small that aggressive financial institutions can't possibly push losses onto the taxpayer. When the country is too small to build a large self-perpetuating defense establishment. of Palm Beach." 2016. 48" x 72", Acrylic on Canvas. I was talking today with Kenneth Walker at a Harvard event. He went to Brown as an undergraduate, and finished up at the Harvard School of Design. He told me the minute he met me that he was an architect inspired by Ayn Rand. He had great faith in the free market and was also on the Palm Beach Planning and Zoning Board. I asked him: "How does a Libertarian function as a member of the Palm Beach Gestapo?" He said, casting his eye to the next table: "I can see a vacant seat or two for you over there." But he was just kidding... I think. Later I checked online and he is portrayed as representing small businesses that are being oppressed by the P&Z Board. A worthy role. He had a lot of interesting things to say. 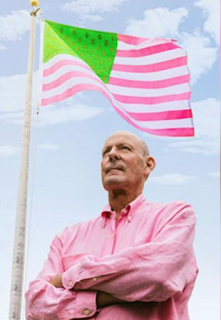 He swam with the pop-art folk in the 1960s and developed his own style, before he started his firm Walker Group Designs. What intrigued me most from an ART BIZ perspective is that he has figured out how to turn his artistic ideas into cash. 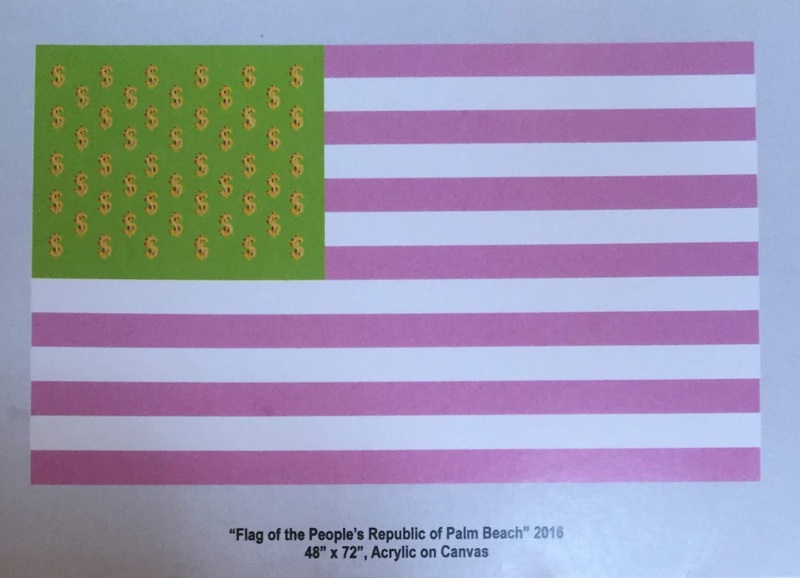 His idea after the election of Donald Trump in 2016 was to develop a flag for the "People's Republic of Palm Beach." I didn't ask him how he interprets his flag. 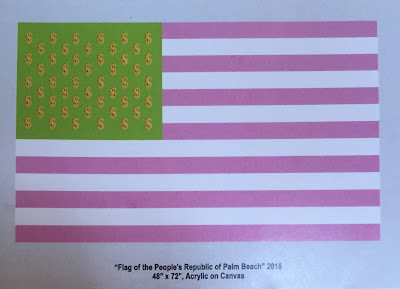 The Palm Beach Post says he just made the British red and blue more tropical, switching to the pastel green and pink of Palm Beach. My own interpretation is that the gold dollar signs are for the Randian producers, who are cornered by the pinko stripes of the moocher-taker-looter-parasites. That would fit the title of the flag and the role the artist plays on the P&Z Board. So I asked him how much he charges for this cute little flag, thinking I could pick up a couple of them as gifts. He said that he had made three paintings in different sizes, selling at $25K, $35K and $45K, as I remember. Then he made the painting into a real flag, ready to haul up the flag pole complete with free grommets to hang it by. 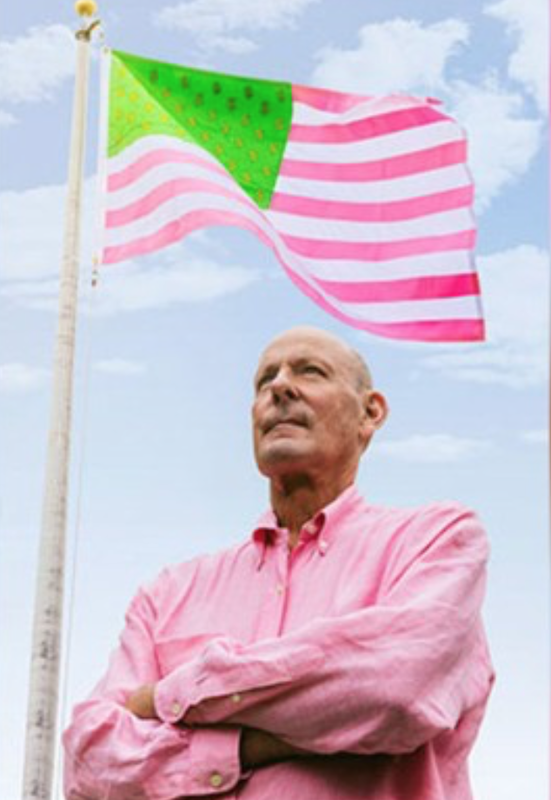 He made 20 numbered flags. He sells them for $10K each. In case you are as curious as I was, he has sold seven of them. So he has 13 left in inventory.